In the late afternoon of Sunday, 20 August 1911, three men strolled into the Louvre museum in Paris. Disguising themselves as museum staff they hid until nightfall. Sixteen hours later the most famous painting in the world, the Mona Lisa, had vanished. The theft of the Mona Lisa was the greatest crime ever to hit the art world. France closed her borders, a massive man-hunt was launched, even Picasso was a suspect - but all to no avail, the Mona Lisa had gone...until two years later when a letter arrived in Florence signed 'Leonardo'; the painting was for sale. 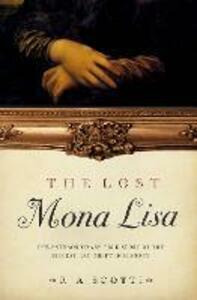 The Lost Mona Lisa uncovers the truth behind the 'crime of the century'. It is a story to rival the best detective fiction - a story of audacious thieves, art forgers, shadowy conmen, millionaire collectors, a global manhunt, and the most beautiful and enigmatic woman in the world, Mona Lisa Gioconda.